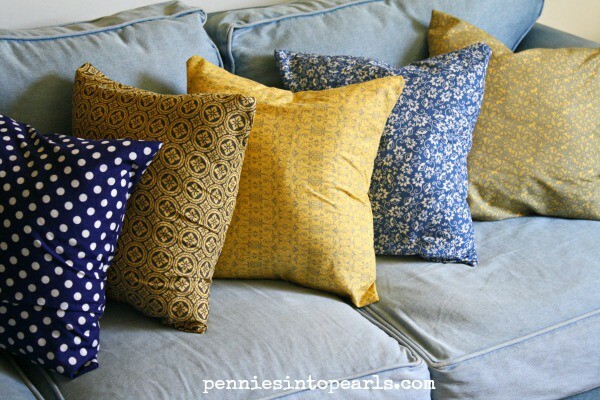 Let me show you how to make pillow covers that will cost you less than $2 each! Plus, each cover will take less than 10 minutes to make! Each pillow I used half a yard of fabric. To find the best deal on fabric, wait for a sale at your local fabric store on online. Then to get even better deals, look for coupons that you can use on top of the sale. I waited for these fabrics to go on sale for $4 per yard and had a 20% off total purchase an Joann’s. Making these covers cost less than $2 each! For this project I was starting from scratch to make the actual pillows. 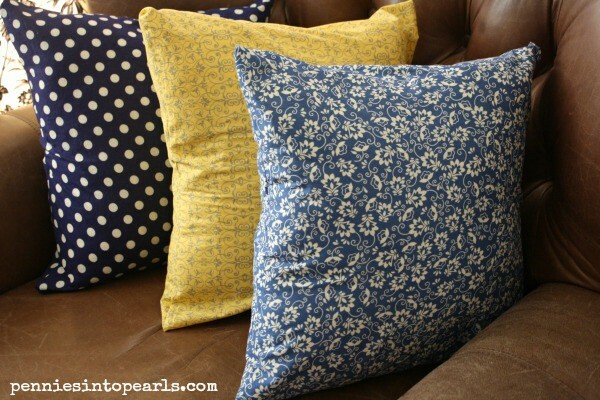 If you already have some pillows sitting around your house that need a makeover then this tutorial is perfect to show you how to make pillow covers for them! First make sure to wash your fabric! Since you plan on washing these in the future, it is necessary to prewash the fabric. That way they don’t shrink later. Now make a pattern for the size of fabric you are going to work with. To make the template, you can use any large pieces of paper. I ended up taping two pieces of newspaper together. Measure the pillow you are going to be covering. Now double the length and add 10 inches. This is how long your pattern needs to be. Take the width of your pillow and add 2 inches. That’s the width of your pattern. Your pattern should be a long rectangle. Cut one piece of fabric for each pillow cover. On each short end of fabric, fold ½ inch seam, press with iron, fold ½ inch again and press with iron. Sew along seam to hold. With fabric laying flat and good side of fabric facing up, fold bottom end up to the middle. Then fold the top end down over lapping the bottom fold. Your new length should now be two inches longer than your actual pillow size. Adjust folds to achieve this length. Pin in place and sew down each vertical side. Make sure to start and stop with a backstitch. Now turn the pillow slipcover right-side out and stuff with pillow. How did yours turn out? I would love to see pictures! Tag me @penniesintopearls on Facebook or @penniestopearls on Twitter. I hope you learned from these tips on how to make pillow covers of your very own and now you don’t have to fear those cute little hands destroying your beautiful new décor! This is SUCH a good tip for how to make an impact in a room without having to break the bank. Thanks Katie! You don’t need to spend a bunch of money to update a room. Thanks for stopping by! PS I love A Touch of Teal! I stop by often!